Uttarakhand Board of Teachnical Education (UBTER) conducts Group C/ Samuh G Exam for the recruitment at different government departments in Uttarakhand. The Samuh G or Gropu C exam in Uttarakhand is providing a change in getting a government job. Large number of Uttarakhand youth are preparing to get a Sarkari Naukari. Success in Group C / Samuh G Exams mainly depends on study material, knowledge and preparation. Study on a smart way will leads you towards success. So to start preparation for any exam make sure that you have the Syllabus of related exam. Samuh G Exam cover exams like Village development officer, Supervisor, Lab Assistant, Stenographer, Data entry operator, Draft man, Government supervisor, Assistant Teacher and many more. For every post we need to check syllabus first. There are lots of topics that needs to cover before exams because those topics will help us to score more marks in examination. So here the first question that will come in mind is "What are those topics?". 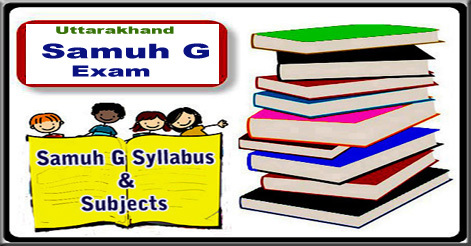 Here we are updating syllabus for Samuh G Exams according to Posts and qualification to help you in Samuh G Entrance Exam. Samuh G Exam is of 100 marks, consisting 50 marks questions from Uttarakhand General Knowledge and other 50 marks questions as per post and qualification. Uttarakhand General Knowledge : History of Uttarakhand, Geography of Uttarakhand, Movements of Uttarakhand, Physical and Political View of Uttarkhand, Culture of Uttarakhand, Economy of Uttarakhand, Nature, Temple, Tourism, Climate, Vegetation, Soil, Minerals, Energy, Forest, Budget of the year, Festival and Fair, Public Well fair, Administration, Language. Hindi, English, Math, Science, Social Science 50 Marks (General study & State), 50 Marks (Essential Qualification) Basic question from all subjects. 94 – , 93, 87, 84, 83, 62, 256, 254, 44. Science with Biology 50 Marks (General study & State), 50 Marks (Essential Qualification) like Physics, Chemistry, Biology. 41, 65, 69, 96, 201, 202, 203, 248. Science with Math 50 Marks (General study & State), 50 Marks (Essential Qualification) like Physics, Chemistry, Maths. Science in Agriculture 50 Marks (General study & State), 50 Marks (Essential Qualification) like Agriculture, Food Processing. Art with Music 50 Marks (General study & State), 50 Marks (Essential Qualification) like Music and instruments. 255, 253, 257, 258, 59, 58, 56, 66, 88, 89, 91, 93, 94, 271, 205, 206, 209, 210, 211, 212, 213, 215, 216, 217, 218, 219. Art with Drawing 50 Marks (General study & State), 50 Marks (Essential Qualification) like Drawing as a subject. Art with Social Science/ Home science 50 Marks (General study & State), 50 Marks (Essential Qualification) like Economy, History, Polity, Geography, Home Science. Diploma in Mechanical / Elecrical / Civil / Electronics / Wood Craft / Value Painter (Manchotrakar) / Hotel Managment / NIS / Agriculture / Computer Science 50 Marks (General study & State), 50 Marks (Essential Qualification) like civil, mechanical, electronics and electrical etc. 72, 44, 61, 69, 72, 87, 90, 91, 94, 98, 202, 203, 238, 268 289. B.Sc with Agriculture 50 Marks (General study & State), 50 Marks (Essential Qualification) like agriculture, Gardening, Entomology. 42, 43, 57, 246, 268, 96. B.Sc with Math / Physics / Chemistry / Botony / Fishery / Computer Science 50 Marks (General study & State), 50 Marks (Essential Qualification) like Math, Physics, Chemistry, Labs, botony, Fishery. 204, 42, 58, 64, 295, 296, 263, 264, 221, 222, 228, 273, 243, 268. BA with Social Science / Home Science / Music / Sanskrit / Law / Journalism / Hindi / English / Economy 50 Marks (General study & State), 50 Marks (Essential Qualification) like History, Geography, Polity, Economy, Home Science, LLB, Hindi, English, Sanskrit. 60, 63, 71, 73, 74, 75, 76, 77, 78, 79, 80, 81, 82, 85, 86, 90, 92, 94, 95, 97, 56, 214, 261, 262, 265, 266, 223, 224, 225, 226, 272, 246, 250, 259, 269, 276, 277, 278, 279, 280, 281, 282, 286, 287, 288, 290, 294. B.Com with Commerce 50 Marks (General study & State), 50 Marks (Essential Qualification) like Commerce, Accounts. 67, 295, 296, 96, 228, 246, 251, 252. Help us to improve this article/job posting "Uttarakhand Samuh G / Group C Exam Syllabus". We would be glad if you can comment below and provide your valuable suggestions and feedback. If this page have any wrong information/list or out of context content, then you can report us as well. pls give me the exam details of post code ——255,262,79,223,213. Pls give detail of post code 65 and how can i fill this form. Is B. Pharma degree holder is also applicable for graduation post code. Is B.pharma degree holder is also applicable for graduation post code. Sir please post code 58 fishery inspector ka exam kb hoga..please sir graduation fisheries kre 3 years ho gye hai..but no response from group c conduct authority..
ubter post code 067 ka resut kab tak ayega or iski OBC ki cut off kitni ja sakti h? respected sir plz provided syllabus of sahayak samaj kalyan adhikari post code 266. Nurse Matern (group c) ka syllabus kya hai? what about BBA course can they apply? 5 sal bad admit card aaya job ke liye 50years lagenge kya sir. please tell me the syllabus of programmer post code 250…. you have mentioned 50 marks GS and Uttarakhand GK and 50 Subjective. but may be from September all the syllabus from subjective. Is it true or not? Sandeep singh Rana…how much marks u expect ??? Sir post code 232 ka syllabus kya h.
post code 264 sahayak adhyapak ki exam date kab aaygi? Sahayak swagaati ye Kwan c post hoti hai kaam kya Karna hota jai usme post code 097?? Thank you for this information and aur kya kya syllabus hai yai bhi batai sir ,aur kaun sai writer ki book best hai yai bhi batai please sir. 268 group ki expected cutt off kya hogi??? Post code 268 expected cutt off ??? ?